Old recording, probably 1972, from Joseph Vicky Amenoudji and Poly-Rythmo. Check out killer sato beat tune "Koutome". 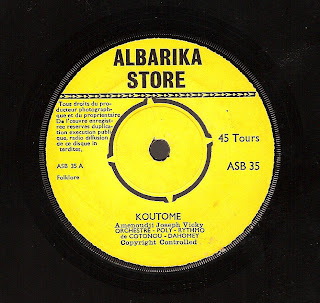 Vieux disque du Poly-Rythmo, probablement de 1972, composé par Joseph Vicky Amenoudji. Superbe rythme sato sur "Koutome"
Nice tunes. Thanks as always. I recently strumbled acros this blog; it's great! I've been listening to African music for over 25 years. In that time I have become very familiar with the the Nigerian, Congolese, Ghanaian and Mandingue styles but haven't had a lot of exposure to the Benin sound. That's why I was so excited to find this blog. You appear to be very passionate about the music of Benin and are doing a great job educating the rest of us who are hungry to learn more about it. I already knew a little about Poly Rythmo from the Soundway collection but that was just a taste. I've already downloaded a few of your Poly Rythmo offerings as well as a couple of the Saghoban Daniel ones. Great stuff! I just attempted to download this most recent Poly Rythmo w/Vicky but was unable to unzip it. It asked me to type in a password that I did not have. Could you share that password so I can listen to some more Poly Rythmo? I'm eager to continue my musical journey through Benin. Parfait pour se réveiller un lundi matin, après quelques jours d'abus en tout genre ! Un régal, merci ! I downloaded Poly-Rythmo and everything seems normal. I don't understand. Keep trying. Norm and Tomix,thanks for your messages and welcome to Oro. Que du bonheur! For those having trouble with extraction...extract but without "extract with full path" checked. That should fix your problems. i can't unzip it with winrar, but winzip unzips it fine. thanks a lot, oro, "koutome" is amazing. I also get the password request. Pity, the Poly-rythmos are great!